Swedish company The Humble Co. is leading a small revolution in oral-care products – from design and manufacture to humbleness. Established in 2013 by dentist Noel Abdayem, following a period of volunteer work in Jamaica, the concept has become a true success story, with its products available in stores and dental clinics in around 30 countries worldwide. All products have been designed and manufactured under the guidance and supervision of a team of dentists, and translate evidence-based innovations into eco-friendly consumer products that are beneficial for everyone to use, including underprivileged people living in remote communities. 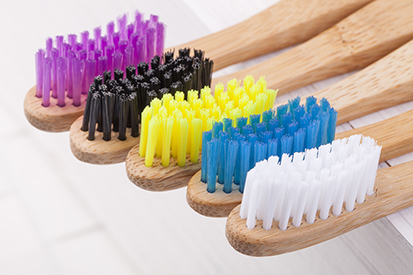 The world consumes more than 3.6 billion plastic toothbrushes every year, and the Humble Brush was developed as an alternative in the fight against plastic consumption. It has a handle made from 100 per cent biodegradable bamboo, with Nylon-6 bristles from Dupont, which are free from the toxin BPA (Bisphenol A). To date, The Humble Co. has sold more than ten million brushes, making it the world’s bestselling bamboo toothbrush for adults. In addition to the popular bamboo toothbrush, the range also includes toothpaste in fresh mint and charcoal, as well as a newly developed kids’ toothpaste – and all toothpastes, of course, contain fluoride. The talented team has also developed an all-natural chewing gum made from natural gum base – yet another step towards eradicating plastics. Next up is cotton buds, in order to meet the forthcoming EU regulation that forbids swabs with plastic shafts. Many children throughout the world have no means of caring for their oral health – dental clinics might be too far away, or even non-existent, and children may lack a toothbrush or toothpaste. An independent organisation called the Humble Smile Foundation therefore develops and delivers programmes to inform, educate and help prevent oral disease, and is current ly working on around 15 projects around the world, including an initiative to raise awareness around sugar consumption. The Humble Co. donates products to the Humble Smile Foundation to help carry out its mission, delivering comprehensive, sustainable preventive oral care to the most vulnerable children around the world. The company also donates a sum of money annually, in proportion to sales in that year, meaning as more products are sold, more projects can be scaled up, thereby reaching more children and preventing more disease. And that means more Humble Smiles all around.